Support for the protoplanet hypothesis has been found by the detection of disk material around of stars, such as Beta Pictoris (below). Thus, the possibility of other solar systems seemed high. 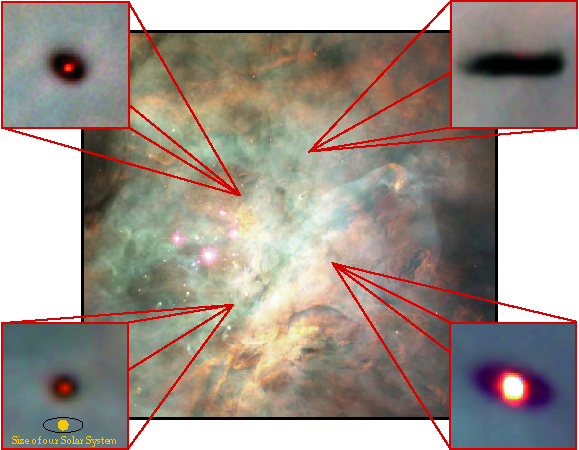 Hubble confirmed the existence of several proto-planetary systems in the Orion nebula, a region of space where stars have just formed only a few 10's of millions of years ago. An exoplanet or extrasolar planet is a planet that orbits a star other than the Sun. 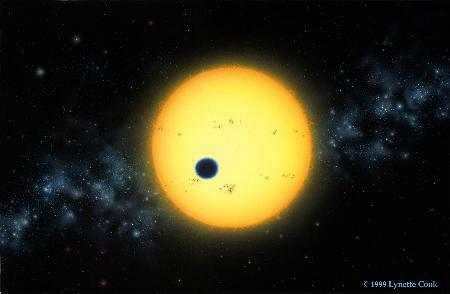 The first scientific detection of an exoplanet was in 1988. 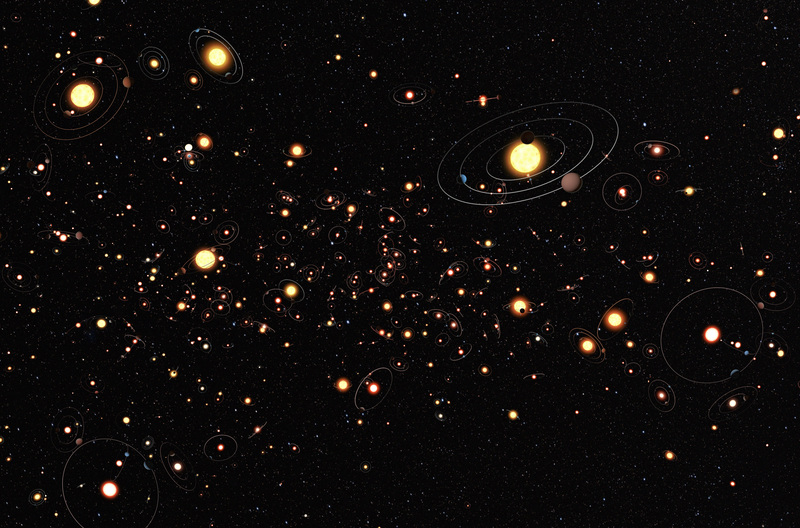 Since then, and as of 1 March 2017, there have been 3,586 exoplanets discovered in 2,691 planetary systems and 603 multiple planetary systems confirmed. On average, there is at least one planet per star, with a percentage having multiple planets. 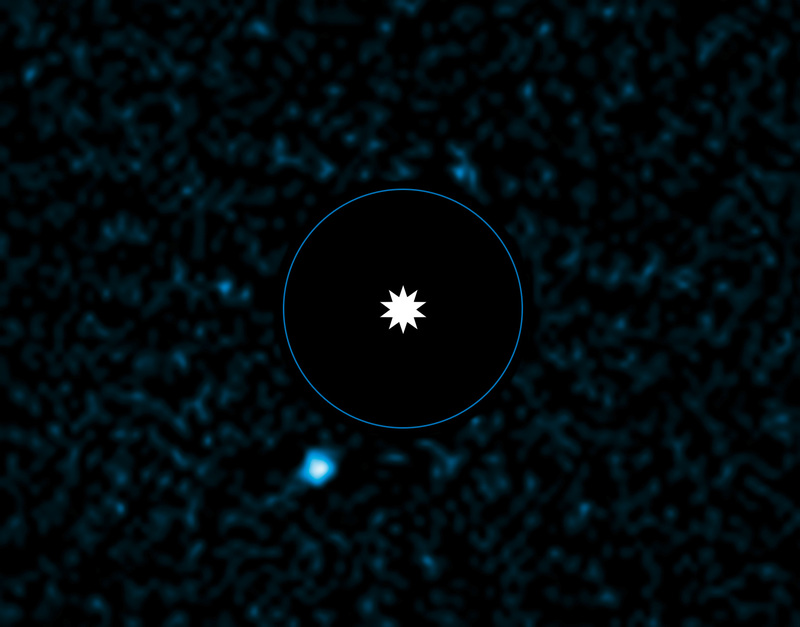 About 1 in 5 Sun-like stars have an "Earth-sized" planet in the habitable zone. Assuming there are 200 billion stars in the Milky Way, one can hypothesize that there are 11 billion potentially habitable Earth-sized planets in the Milky Way, rising to 40 billion if planets orbiting the numerous red dwarfs are included. 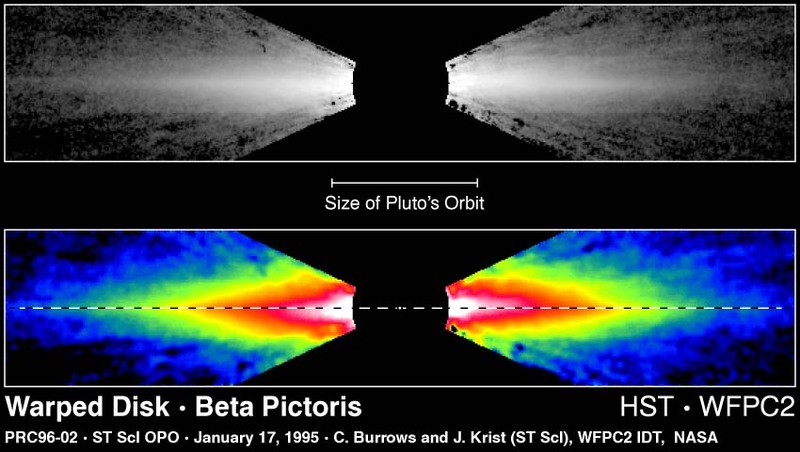 Doppler spectroscopy is used to detect the periodic velocity shift of the stellar spectrum caused by an orbiting giant planet. This method is also referred to as the radial velocity method. From ground-based observatories, spectroscopists can measure Doppler shifts greater than 3 m/sec due to the reflex motion of the star This corresponds to a minimum detectable mass of 33 Earth masses for a planet at 1 AU from a one solar-mass star. All stars exhibit some Doppler shift because all stars are moving in the gravitational field of our Galaxy. But the stars that move toward us, then away from us, then toward us again wobbling with periodic motion are gravitationally bound to another object. The magnitude of this changing velocity, together with the period of the motion, reveals the mass of an invisible companion to a visible star. Our Sun moves with a speed of about 12 meters/sec due to the most massive planet in our Solar System, Jupiter. The periodicity of the Sun's motion is the same as the orbital period of Jupiter: one cycle takes about twelve years. 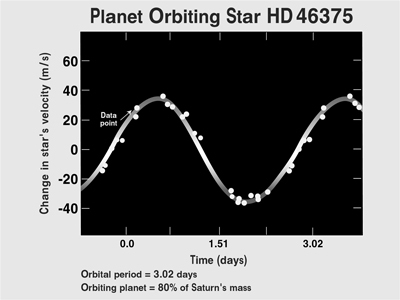 A more direct measure occurs is a planet transits across the front of a star, as happened with HD 209458, a distant planet passing in front of its star, providing direct and independent confirmation of the existence of extrasolar planets. Astronomers predicted the planet would cross the face of the star if the planet's orbital plane were lucky enough to carry it between Earth and the star. Until now, none of the 18 other extrasolar planets discovered has had its orbital plane oriented edge-on to Earth so that the planet could be seen to transit the star, nor have any of the other planets discovered by other researchers. However, on Nov. 7, 1999 an automatic telescope observed a 1.7 percent dip in the star's brightness. With the orbital plane of the planet known, the astronomers for the first time could determine precisely the mass of the planet and, from the size of the planet measured during transit, its density. Interestingly, while the planet's mass is only 63 percent of Jupiter's mass, its radius is 60 percent bigger than that of Jupiter. This fits with theories that predict a bloated planet when, as here, the planet is very close to the star. Planets are extremely faint light sources compared to stars, and what little light comes from them tends to be lost in the glare from their parent star. So in general, it is very difficult to detect and resolve them directly from their host star. 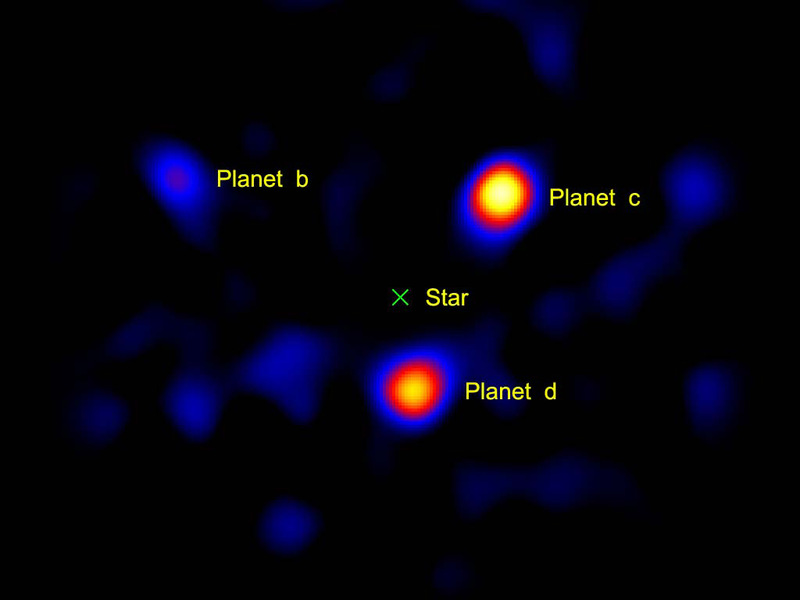 Planets orbiting far enough from stars to be resolved reflect very little starlight, so planets are detected through their thermal emission instead. It is easier to obtain images when the star system is relatively near to the Sun, and when the planet is especially large (considerably larger than Jupiter), widely separated from its parent star, and hot so that it emits intense infrared radiation; images have then been made in the infrared, where the planet is brighter than it is at visible wavelengths. Coronagraphs are used to block light from the star, while leaving the planet visible. Direct imaging of an Earth-like exoplanet requires extreme optothermal stability. Three planets were directly observed orbiting HR 8799, whose masses are approximately ten, ten, and seven times that of Jupiter. It is known that small planets (of roughly Earth-like mass or somewhat larger) are more common than giant planets. 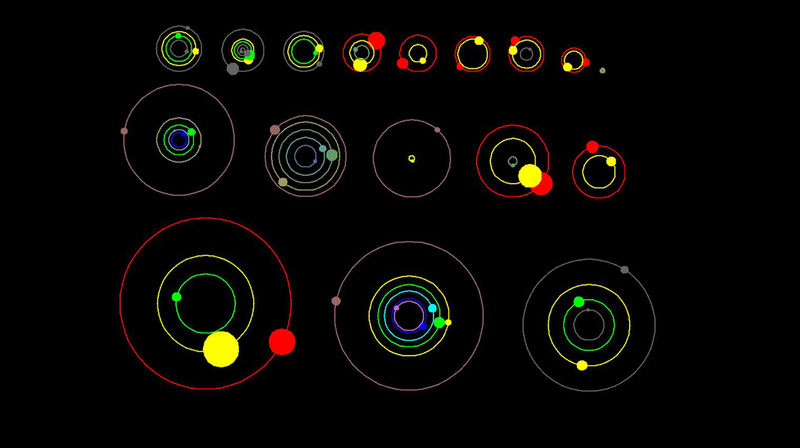 It also appears that there are more planets in large orbits than in small orbits. 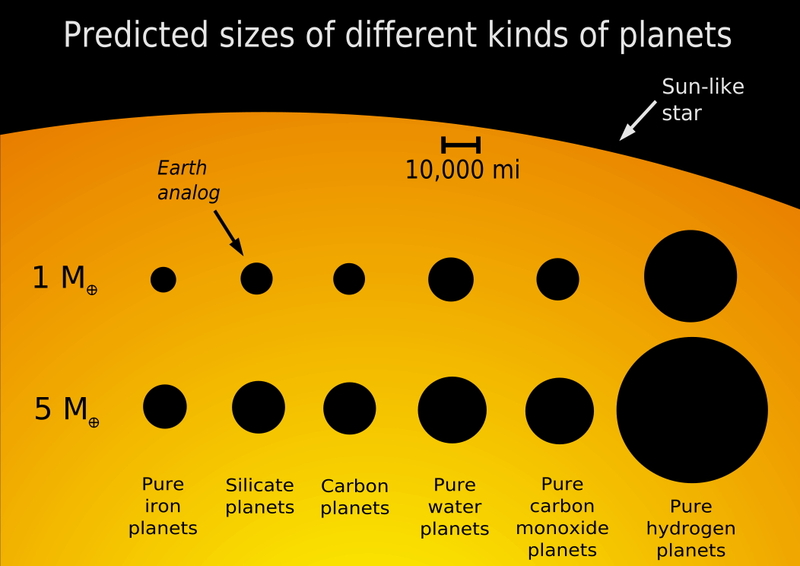 Based on this, it is estimated that perhaps 20% of Sun-like stars have at least one giant planet, whereas at least 40% may have planets of lower mass. A 2012 study of gravitational microlensing data collected between 2002 and 2007 concludes the proportion of stars with planets is much higher and estimates an average of 1.6 planets orbiting between 0.510 AU per star in the Milky Way. The authors of this study conclude that "stars are orbited by planets as a rule, rather than the exception". Hot Jupiters (also called roaster planets, epistellar jovians, pegasids or pegasean planets) are a class of exoplanets that are inferred to be physically similar to Jupiter but that have very short orbital radii with semi-major axes from 0.015 to 0.05 astronomical units. 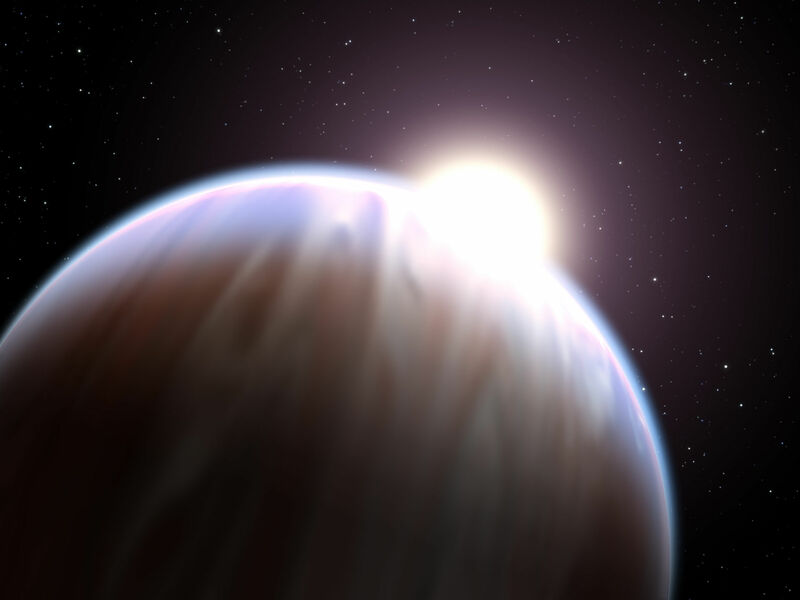 The close proximity to their stars and high surface temperatures resulted in the moniker "hot Jupiters". Their defining characteristics are their large masses and short orbital periods, spanning 0.36-11.8 Jupiter masses and 1.3-111 Earth days. The mass cannot be greater than approximately 13.6 Jupiter masses because then the planet would start burning deuterium and become a brown dwarf. A super-Earth is an extrasolar planet with a mass higher than Earth's, but substantially below the masses of the Solar System's ice giants, Uranus and Neptune, which contain 15 and 17 Earth masses respectively. The term super-Earth refers only to the mass of the planet, and so does not imply anything about the surface conditions or habitability. The alternative term gas dwarfs may be more accurate for those at the higher end of the mass scale, as suggested by MIT professor Sara Seager, although mini-Neptunes is a more common term. In general, super-Earths are defined exclusively by their masses, and the term does not imply temperatures, compositions, orbital properties, habitability, or environments. While sources generally agree on an upper bound of 10 Earth masses (~69% of the mass of Uranus, which is the Solar System's gas giant with the least mass), the lower bound varies from 1 or 1.9 to 5, with various other definitions appearing in the popular media. The term "super-Earth" is also used by astronomers to refer to planets bigger than Earth-like planets (from 0.8 to 1.25 Earth-radii), but smaller than mini-Neptunes (from 2 to 4 Earth-radii). This definition was made by the Kepler Mission. Some authors further suggest that the term be limited to planets without a significant atmosphere, or planets that have not just atmospheres but also solid surfaces or oceans with a sharp boundary between liquid and atmosphere, which the four giant planets in the Solar System do not have. Planets above 10 Earth masses are termed massive solid planets/mega-Earths or gas giant planets depending on whether they are mostly rock and ice or mostly gas. Due to the larger mass of super-Earths, their physical characteristics may differ from Earth's; theoretical models for super-Earths provide four possible main compositions according to their density: low-density super-Earths are inferred to be composed mainly of hydrogen and helium (mini-Neptunes); super-Earths of intermediate density are inferred to either have water as a major constituent (ocean planets), or have a denser core enshrouded with an extended gaseous envelope (gas dwarf or sub-Neptune). A super-Earth of high density is believed to be rocky and/or metallic, like Earth and the other terrestrial planets of the Solar System. A super-Earth's interior could be undifferentiated, partially differentiated, or completely differentiated into layers of different composition. If a super-Earth is detectable by both the radial-velocity and the transit methods, then both its mass and its radius can be determined; thus its average bulk density can be calculated. The actual empirical observations are giving similar results as theoretical models, as it's found that planets larger than approximately 1.6 Earth-radius (more massive than approximately 6 Earth-masses) contain significant fractions of volatiles or H/He gas (such planets appear to have a diversity of compositions that is not well-explained by a single mass-radius relation as that found in rocky planets). After measuring 65 super-Earths smaller than 4 Earth-radii, the empirical data points out that Gas Dwarves would be the most usual composition: there is a trend where planets with radii up to 1.5 Earth-radii increase in density with increasing radius, but above 1.5 radii the average planet density rapidly decreases with increasing radius, indicating that these planets have a large fraction of volatiles by volume overlying a rocky core. Similar results are confirmed by other studies. The new research suggests that the rocky centres of super-Earths are unlikely to evolve into terrestrial rocky planets like the inner planets of the Solar System because they appear to hold on to their large atmospheres. 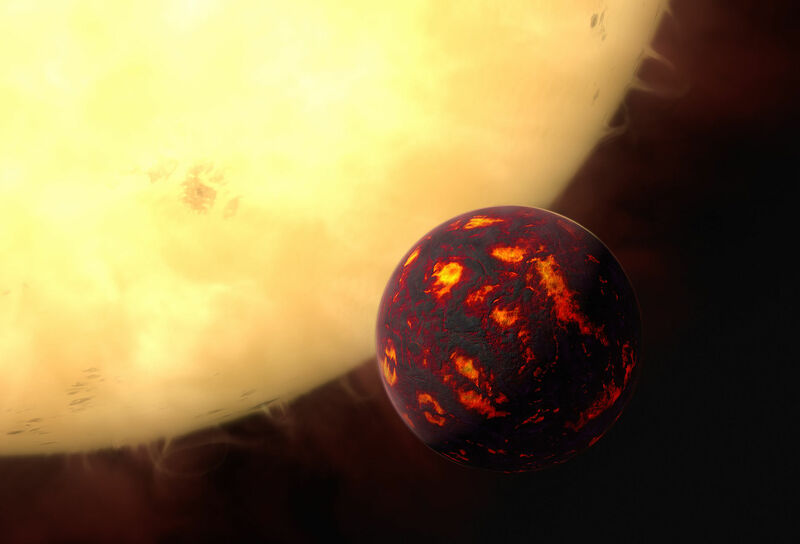 Rather than evolving to a planet composed mainly of rock with a thin atmosphere, the small rocky core remains engulfed by its large hydrogen-rich envelope. Theoretical models show that Hot Jupiters and Hot Neptunes can evolve by hydrodynamic loss of their atmospheres to Mini-Neptunes (as it could be the Super-Earth GJ 1214 b), or even to rocky planets known as chthonian planets (after migrating towards the proximity of their parent star). The amount of the outermost layers that is lost depends on the size and the material of the planet and the distance from the star. In a typical system a gas giant orbiting 0.02 AU around its parent star loses 5-7% of its mass during its lifetime, but orbiting closer than 0.015 AU can mean evaporation of the whole planet except for its core.